Any woman looking to go on an elating adventure should have a comfortable, yet stylish pair of sandals to go with. This is because sandals, unlike boots and shoes, are lightweight and more breathable, which helps reduce fatigue on a long hike. If you are looking for the best hiking sandals, you cannot go past the Plaka Women's Hiking Sandals. Born on a Greek Isles vacation, these sandals are handcrafted with high-quality rubber and stretch-to-fit braided rope straps to offer comfort. Other than hiking, the sandals make the perfect footwear. They are sturdy, great for all sorts of surface and are comfortable to walk in for all day sightseeing. The Plaka Women's Hiking Sandals come in a variety of colors and straps and are adjustable to reduce the risk of causing blisters. You can count on them to keep your feet feeling great all day long. So whether you enjoy walking on the beautiful beaches in the Dominican Republic or you plan on hiking the Uetliberg in Zurich, then you should definitely check these out. Just like good hiking boots, these sandals offer bouncy, rubber soles with a good tread and non-slip grip. These Plaka hiking sandals are designed with great arch support that ensures your feet stay comfortable even after hours of walking. They also have a deep heel cup that helps hold your heel in place as you take your hike. Since these sandals come with a bouncy and lightweight sole that offers excellent traction, they perform well as walking shoes on both long and short hikes. The traction also makes the sandals suitable for a range of surfaces, including hiking trails and city streets. The Plaka Women's Hiking sandals come in colorful, soft nylon straps that offer a snug and comfortable fit, protecting you from painful blisters. They are supportive without being restrictive and are easily adjustable. The straps also make it easy for you to take your sandals on and off. These sandals are made from good quality material, including mesh straps, rubber soles, and synthetic uppers. There is nothing worse than walking in soggy sandals in the middle of a 15-mile hike. Fortunately, the material is also waterproof, which allows you to take your hikes even during periods of rain. Other than being comfortable and practical, the Plaka Hiking Sandals are some of the most stylish shoes you will ever wear. 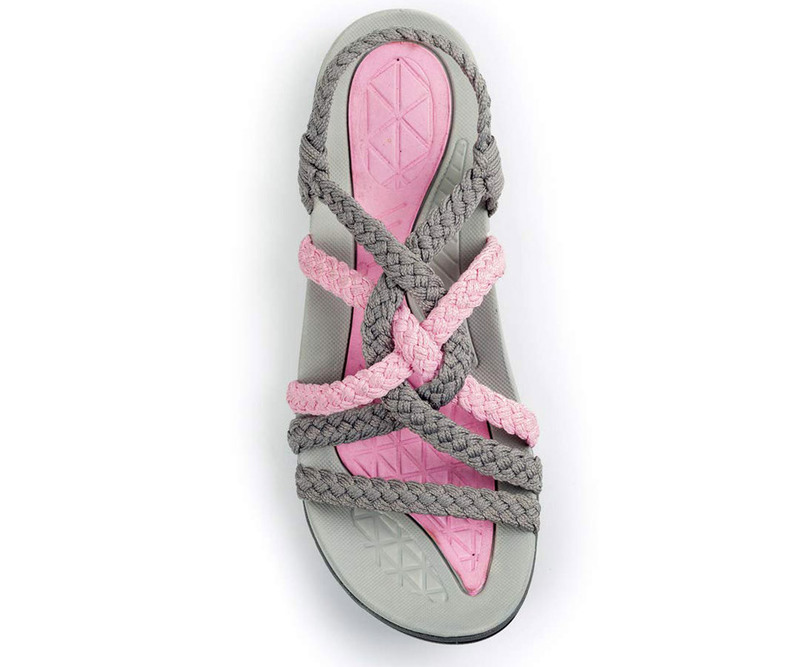 These sandals feature a creative hand braided rope design that is elegant and makes it stand out from the rest. They come in 11 assorted, cool and unique colors for you to choose the one that best suits your style and personality. Plaka Sandals have been earning a cult following since they first hit the market, and it is easy to see why. Other than being affordable, they deliver on both style and comfort exceptionally. Their effortlessly stylish and boho vibe is versatile, meaning you can wear them in any situation. What's more, a good pair of hiking sandals can be so much more comfortable than chunky hiking boots and shoes, especially if you are hiking during the hotter months.